There was nothing which was left out, from these conversation. Though it started from an informal basic introduction, and sharing each of our spiritual experience and perspectives on “Advaita” school of philosophy, but it extended to history, geography all kinds of popular cultural discussion, related to movies , books and then it even went into some of the areas of parapsychology , mysterious spiritual groups and how they are working in changing the world , voluntary projects and finally to politics and music. Though these topics never came in an order, and popped up spontaneously, according to the mood of discussion. Gripped with my heritage, with Bengali form of “adda” , it became quite easy for me to make friends , hold discussions and build bridges of understanding. Even though the discussion started with mundane topics , but with time , the aura of Arunachala, would come in effect and discussion, would finally lead to each one of us spiritual experiences and perspectives, and sharing them in the most creative way. At the end , it would look like as if I had found another way to approach reality . From my humble start with “circumbation around Arunachala and worshiping Arunachala” , with attitude of exclusivity “Only ,and best way” turned into inclusivity and streams of acceptance of “ Every way were best dependent, on that particular person spiritual development “ . There is a similar kind of effect, which I find in Arunachala Mahaymaya, where the entire sadhana around Arunachala came in between the conversation between Maharishi and Gauri – The Universal Mother Goddess. While holding the discussion, Gautama Maharishi would often swap into a more deeper and multilayered conversation , and that could even lead to the boons and the wisdom he received from Arunachala himself. Such kind of multilayered conversation, and stories in between could be only found in another classical work by “Maharishi Balmaki” which is known by “Yoga Vasistha” and some like to call it, also as “Maharamayana”. It is said , as Bhagvad Gita holds the central philosophy of Mahabharata , “Maharamayana” on the other end holds the central philosophy of Ramayana. Interestingly , “Maharamayana” also known as “Yoga Vasisth” was the theme of Guru Poornima Retreat 2012, organised by Sri Joydip Ashram , where participants went through detail discussion and contemplation on “Maharamayana”, while circumbating the Arunachala , and also at the time of Workshop. 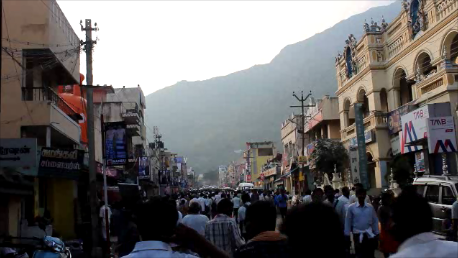 While Maharishi Gautama carried on his conversation with Mother Gauri, on the instruction given by “Arunachala” to him , the proper order of chanting Arunachala’s different names, while offering flowers and the rules prescribed for it , those streams of love, acceptance and peace could come in natural effect .